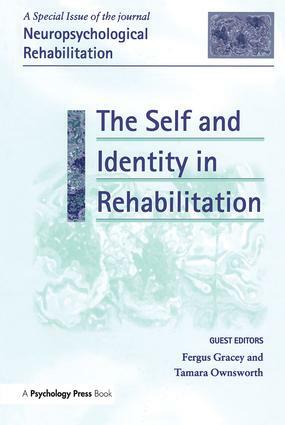 This special issue brings together developments in neurological, psychological and social understanding of sense of self and identity in neuropsychological rehabilitation. Following brain injury and in the context of neurological illness, both the individual and their loved ones report changes in personality, sense of self or identity. This issue is intended to be a key resource for clinicians trying to tackle these challenges, as well as researchers interested in the self and identity in clinical populations. New theoretical perspectives on the self, as well as quantitative and qualitative research studies, and clinical and service issues are covered. B.A. Wilson, M. Kopelman, N. Kapur, Prominent and Persistent Loss of Past Awareness in Amnesia: Delusion, Impaired Consciousness or Coping Strategy? A. Fotopoulou, False Selves in Neuropsychological Rehabilitation: The Challenge of Confabulation. G.N. Yeates, F. Gracey, J. Collicutt McGrath, A Biopsychosocial Deconstruction of ‘Personality Change’ Following Acquired Brain Injury. E. Naylor, L. Clare, Awareness of Memory Functioning, Autobiographical Memory and Identity in Early-stage Dementia. S. Cooper-Evans, N. Alderman, C. Knight, M. Oddy, Self-esteem as a Predictor of Psychological Distress After Severe Acquired Brain Injury: An Exploratory Study. F. Gracey, S. Palmer, B. Rous, K. Psaila, K. Shaw, J. O’Dell, J. Cope, S. Mohamed, "Feeling Part of Things": Personal Construction of Self After Brain Injury. K. Cloute, A. Mitchell, P. Yates, Traumatic Brain Injury and the Construction of Identity: A Discursive Approach. C. Haslam, A. Holme, S.A. Haslam, A. Iyer, J. Jetten, W.H Williams, Maintaining Group Memberships: Social Identity Continuity Predicts Well-being After Stroke. T.L. Ownsworth, M. Turpin, B. Andrew, J. Fleming, Participant Perspectives on an Individualised Self-awareness Intervention Following Stroke: A Qualitative Case Study. M. Ylvisaker, K. McPherson, N. Kayes, E. Pellett, Metaphoric Identity Mapping: Facilitating Goal Setting and Engagement in Rehabilitation After Traumatic Brain Injury. M. Massimi, E. Berry, G. Browne, G. Smythe, P. Watson, R.M. Baecker, An Exploratory Case Study of the Impact of Ambient Biographical Displays on Identity in a Patient with Alzheimer’s Disease. R. Coetzer, Holistic Neuro-rehabilitation in the Community: Is Identity a Key Issue?